Many of the budget-conscious among us often find ourselves wondering how to get free food. Having the opportunity to try new things for free feels like a serious win. With plenty of ways to score free food, why pay if you don’t have to? You’re probably wondering if getting free food is legit. 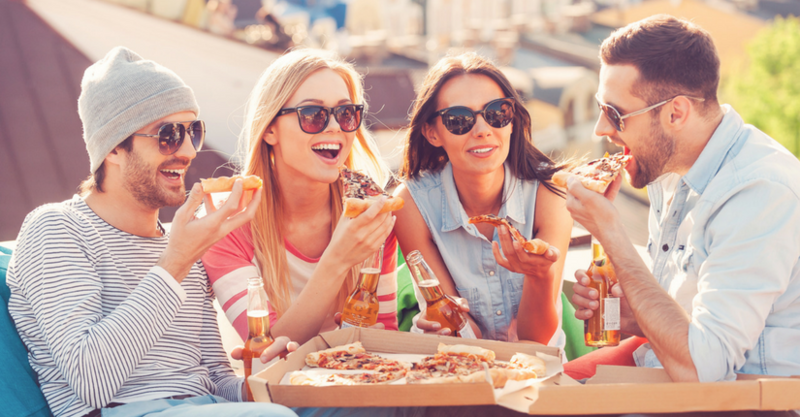 Let’s take a look at 10 of the best ways how to get free food without a lot of hassle. How to Get Free Food: Just Go Get It! One clever way of getting free food is as simple as downloading an app. If you have ever wondered how to get free food online, you’ll be happy to hear it’s much easier than you think. Many places like fast food chains, quick service restaurants, coffee shops and many other takeaway food locals offer a free menu item just for downloading their app. In order to keep you coming back after that first visit, most of these apps offer up freebies either weekly or monthly. Just pay attention because many do come with an expiration date. Getting free food is as easy as a quick download in many cases. • McDonald’s app – when you download and create an account you get a free menu item, as well as weekly deals like free fries and free coffee beverages. • Krispy Kreme Rewards app – a simple download offers up a free donut when you sign up, freebies on your birthday and periodic deals and free food. • Panera Bread –wWhen you download the Panera app and create a profile you can get a free pastry item of your choice. Panera is also known to offer freebies through their app regularly. Getting a freebie for downloading doesn’t mean that you should delete that app after you take advantage of the introductory offer. Most of these apps offer additional free food and other deals throughout the year, so log in and watch for other great ways to score free food. While it might seem like the couponing trend is over, the reality is couponing is alive and well — just in a different form. The days of clipping coupons from the newspaper or print off are just about gone. They have been replaced (like so many other things) by their digital counterpart. Since things have moved away from paper and into our phones and devices, cash back is now the way to go to get food for free or almost free. Our favorite food cash back app is Ibotta. Click here for a $10 sign-up bonus when you sign up with Ibotta! When you begin a search for “mystery diner” one of the most common searches is whether mystery diners are a real thing. Yes, signing up to be a mystery diner means free food at some great spots. One you become a mystery diner you will be able to get free food and drinks, and sometimes from some fairly swanky establishments. Mystery diners have the chance to check out different hotspots and rate their experiences. One of the leaders in mystery dining invites people to apply to become diners. They ask that you be able to write about your experiences, as well as be available via phone to discuss your free food. The only drawback to this kind of free food option is that you will have to put the money out up front. You are usually reimbursed in the weeks after your visit. Click here to learn how to become a mystery diner. A new trend that is cropping up in stores throughout the United States is to offer patrons snacks and beverages while they shop. In the past the only way you were getting free food while you shop is if free samples happened to be in the store on the day you shop. Now, many grocery stores offer a snack station as you enter the store. Many such stores starting out by offering a free healthy snack, like a piece of fruit, for children who enter the store. he idea was that if you keep kids happy and fed, they won’t drive their parents out of the store. What savvy shopkeepers found was that this idea is the same for shoppers. Yes, hungry shoppers buy more, but so do happy customers. To capitalize on this, some stores now have a spot to grab a quick cup of water, coffee or tea, as well as healthy snacks to munch while you shop. By knowing which stores offer up such freebies, you can even window shop your way to a free snack. Over the past few years, food delivery services of all kinds have revolutionized the way people eat and cook. Whether you are looking for delivery from your favorite fast food restaurant or chain or you want a ready to go box of ingredients complete with recipe, getting free food delivered is simple. For years people have been able to get pizza and other take-out food delivered right to their door. Recently, this service has been expanded to include everything from chain restaurants to fast food joints. If you are in the mood for something tasty and ready to eat, having free food delivered is an easy way to get your favorites. There are several companies that will deliver your food, many of which will provide the service free on your first use. • Amazon Restaurants details right on their homepage what you will pay for delivery. If you pay attention you will find that some restaurants offer free or very low-cost delivery. Taking advantage of these awesome delivery services is a great way to get free food from fast food restaurants and other takeaway restaurants. Another way to get free food delivered is to take advantage of trial offers given by the many food delivery services. These services have curated meals and include a recipe and all of the necessary ingredients. Most are offered with multiple plan sizes and frequencies. What’s even better is that most of these companies will offer you a free or low-cost trial period to try to win your business. If you are savvy enough to take advantage of the trial and cancel before you are billed, you may have cracked the code for how to get free food delivered to you. • Hello Fresh offers different offers for free food delivered to you, depending upon the time of year. • Blue Apron is another food delivery service where you can try before you buy. Their initial sale price varies, so watch their website for the best deals. Just be careful to cancel the subscription before it automatically renews. We could probably write an entire guide titled: “How to get free food on your birthday.” But we’ll save that guide for another day. What’s important to know are the main ways that you can score free meals, drinks and snacks on your big day. Many restaurants have loyalty or club cards that allow you to do everything from earn points to access savings. One hidden benefit of many of these clubs is birthday freebies. When you sign up, make sure to include your birthday when asked. When your birthday comes around you can often use your card for a special freebie. Applebee’s E-Club Members can get a free dessert on their birthday. Buffalo Wild Wings Buffalo Circle Club offers up a free basket of wings during the two-week period surrounding your birthday. IHOP’s Pancake Revolution Club gives you a free short stack of pancakes on your birthday AND on the anniversary of your join date. These clubs were more popular in the past, but some still hang around. Baskin Robbins Birthday Club gives you a free ice cream on your birthday. If you have an online account at Pizza Hut, you are automatically enrolled in their birthday club and will get free cinnamon sticks on your big day. There are even a handful of eateries that still serve up free birthday food if you can prove it’s your birthday. Outback Steak House will serves up free ice cream on your birthday. You can drop by most Rita’s Water Ice locations nationwide to get a free water ice or free ice cream on your birthday. Many retailers have certain days during the week when you can take advantage of free samples of all kinds. The majority of the members only warehouse stores have free samples on almost any visit. But on the weekends, you can find samples on almost every corner. Remember, while its “members only” to check out, no one asks for your member card when you try samples. In fact, Costco employees even created a set of guidelines on how to get the most from your samples during each visit. You should also keep an eye out for special days where grocery stores and other food retailers open up their doors for special sample days. Often times when the season changes, stores welcome customers to check out new items by offering them free samples. Also, be on the lookout for customer appreciation days. These are days where you might be able to score something a little bigger and better than your average free sample. Don’t forget to mark your calendar for national Free Donut Day, which is on June 1st of each year. One more way to get free food is to go to the places where free food is given away plentifully. If you have ever been to an open house, meeting or other such gatherings, you know that food is readily available. These gatherings are a perfect opportunity to get access to free food. Maybe there is a networking event at a gym, club or business you frequent. Chances are if you attend, that free food will be part of the deal. Look at these as opportunities to get to know people, learn something new and get a free meal. This one is almost so obvious that you might miss it. More and more companies are offering meals and snacks as a way to incentivize spending more time at the office. Companies like Asana, Yahoo and Glassdoor provide free meals for their employees. And we’re not talking soggy sandwiches. A rising number of businesses are jumping on the bandwagon of feeding their employees. So, if free food is something that is important to you, finding an employer who will add snacks and meals to the benefits package might be the sweetest deal of all. We can’t end the list of ways to get free food in 2018 without making mention of growing your own. An indoor or outdoor garden can be a fun project that also helps put food on the table. Ok, maybe you’re not going to go out and build a chicken coop overnight. But, starting a small garden can help keep food costs down. Creating your own garden is a small investment that can payout big in the long-run. Many plants come back year after year and even plants that need replacing annually can save you hundreds on your shopping bill. There are so many ways to get free food that if you used them all you would barely have to pay a penny for meals. While, most of us won’t make a full-time job out of scoring free food, it is nice to be able to save some money and try something new. What’s clear is that it’s not just about how to get free food, but how many new things you will get to try. Take advantage of these awesome ways to get free food and enjoy the food and the savings!